So I'm going through this mountain of old Colorado Springs newspapers, when I spot this story, in a 1972 Colorado Springs Gazette-Telegraph. The band's name was one I hadn't seen before, in my research, nor could I find any additional information on the group. 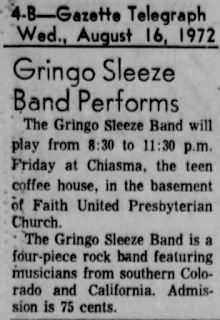 Thankfully, the Internet leads me to Stephen Thomas, the keyboardist for the Gringo Sleeze Band, who was invaluable, in solving this mystery. NOTE: The other members of the band preferred that their names not be included, in this story, hence the omission. 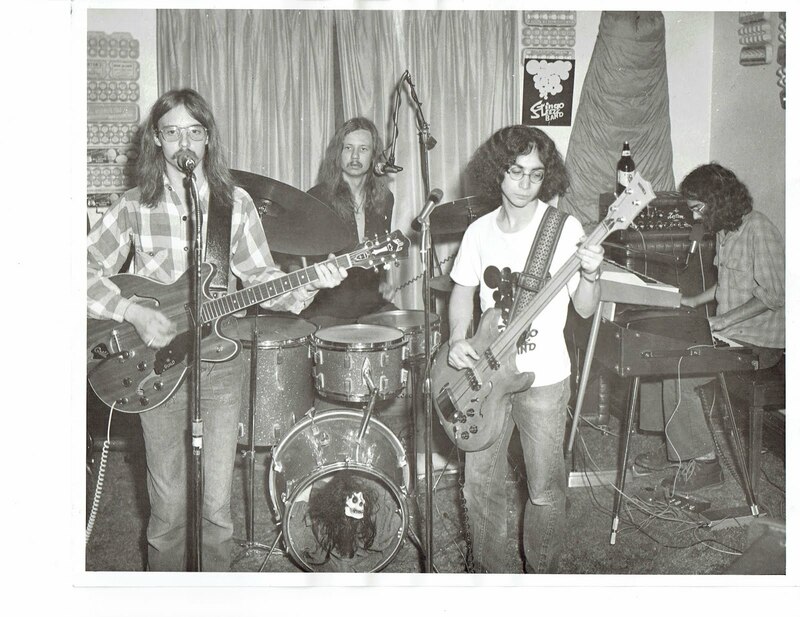 "The band that eventually gigged around Colorado for a couple of years [1970-1973], was the second iteration of a project that started about 1968, by me and a guitarist in Colorado Springs. The first attempt yielded a three-piece group: guitar, keys, and drums, and a band house that we lived in for a few months, before things fell apart, namely the drummer went chasing after different projects. The band house was the only place where anybody ever succeeded in stealing my boots. In those days I was stomping around wearing a black flat-rimmed hat, and John Lennon glasses." "It was in this period that we were slouched on a couch, relaxing after a hard day's rehearsal. One of our friends looked in at us and exclaimed, 'What a bunch of sleazy gringos!' We liked the sound of that. After that initial attempt, I hitchhiked back to San Diego for about a year, and drove a cab. The guitarist/lead vocalist was still wanting to put a band together, and I was willing to make a second attempt, so he drove out to the coast to pick me up. This time we settled at his parent's Rocky Ford house, for a couple of months, before getting a band house, on the outskirts of La Junta." Do you recollect your first gig? "As I recall, our first gig was at a beer bar in La Junta, near Otero Junior College. We also played several times at The Keg, a raucous establishment on the outskirts of town, that later was turned into a church. I wonder how many present-day worshipers recall its previous incarnation? Later, we played at many 3.2 bars throughout Colorado, and I enjoyed seeing the state as a traveling musician." What did a usual Gringo Sleeze Band set consist of? "Because of the tastes of our audience, we played covers of popular songs on the radio: Stones ("Sympathy for the Devil"), Deep Purple ("Smoke on the Water"), Eagles ("Take it Easy"), Jefferson Airplane ("Last Wall of the Castle"), Doors ("Crystal Ship" "Maggie McGill"), The Who ("Won't Get Fooled Again"), Credence Clearwater ("Suzie Q") etc. We played a few originals as well--written either by me or the guitarist. At that time, Colorado liquor laws allowed the sale of 'near-beer' (3.2 % alcohol) to eighteen year-olds. This quirk meant that numerous bars specialized in selling this beer to younger people, who tended to like rock music. 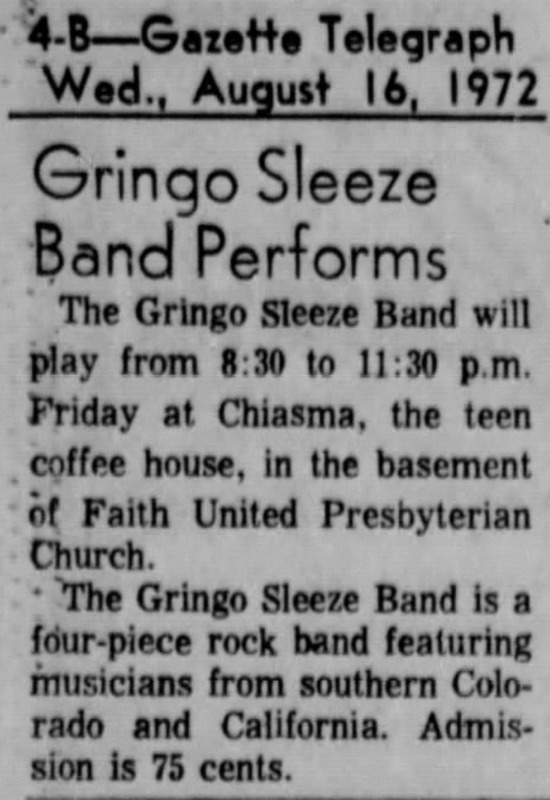 The Gringo Sleeze Band existed because we were able to convince the purveyors of these fine liquids that our appearance at their establishments would aid them in their business efforts. " Was the band ever close to making it big? "No! Our biggest gig was maybe the Air Force Academy homecoming (circa 1973), or when we played a county fair. We didn't rehearse diligently enough or put in the effort required to develop past our beginnings. I was a decent enough rhythm piano player, with some experience in improvisational theatre, but musically weak in scales and technique. Certainly other performers, with similarly limited skills, have gone further than I did. However, the band could deliver an energetic on-stage performance--we had nights when we played solid sets, especially after we added our frontman. I had some illusions about fame and fortune when the band started, but they were mostly idle musings rather than driving ambitions. Mostly, I wanted to meet girls, and the band definitely provided some opportunities in that regard--no regrets there. Would I do it again? In a heartbeat - although I'd practice a lot more." How did the band break up? "As I recall, it was precipitated by the departure of the bass player. Perhaps we could have gotten a new bass player, but I had the feeling that I had played out that string and that it was time to move on. For a while, I played with a band named Winterheat, a group that possibly had more potential. However, when the guitarist of that group refused to pay the agent fee for a booking, I got on my high horse and left town. I had become disillusioned at the prospects for making a decent living as a musician, and had the feeling that if I kept playing in bars I would end up as a down and out alcoholic, and would never be able to support a family. I went back to San Diego and, with help from my parents, graduated from college and got a job in child protective services. I worked twenty years in Los Angeles County. Now I'm retired and split my time between Portland Oregon, and Georgetown Texas. I'm still writing songs, trying to become a better musician, and enjoying being with my children and grandchildren."